Please join me in offering a hearty congratulations to Houston Texans quarterback Tom Savage, who today becomes the first two-time recipient of our Bad Quarterback of the Week honors. When we last visited with Savage, he was leading the Texans to a Week 1 loss against the Jaguars. 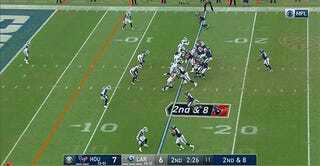 He was sacked six times in the first two quarters, and then got yanked at halftime to make way for rookie Deshaun Watson. That turned out to be a good decision by head coach Bill O’Brien—the Watson part, not the Starting Tom Savage In Week 1 part—as it didn’t take long for Watson to establish himself as one of the most exciting players in the league and turn the Texans’ offense into one capable of hanging 30 or more points on any opponent. Then Watson tore his ACL, because this world is fucked and awful, and Savage found himself back in the starting lineup. He picked up where he left off. In his first game back under center, a Week 9 contest against the Colts, Savage guided the Texans to a dispiriting 20-14 loss. Sunday’s game was also bad—the Texans lost 33-7 against the Rams—and Savage did a lot of the same things he did in the first half of that Week 1 game. Which is to say he moved very slowly and got lit up. There’s good reason to feel pity for Savage, who has not received much protection from his offensive line this season. Aaron Donald and the other monsters along the Rams’ defensive line were in his chest all game, and playing quarterback under those circumstances is no fun at all. 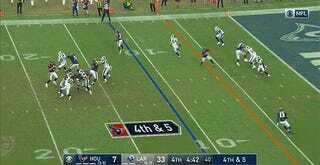 But we have a control, here, that helps us ascertain just how lame Tom Savage is. Watson played behind the same offensive line, and he managed to complete over 60 percent of his passes and throw for 19 touchdowns in seven games. To play quarterback well at the highest level of the sport is to exert moments of absolute control over the ceaseless violence and chaos of a football field. A perfect three-step drop followed by a precisely timed back-shoulder throw down the sideline is beautiful on its own merits, but also because it means you’ve cut through that towering wall of noise and produced a clean, positive result. 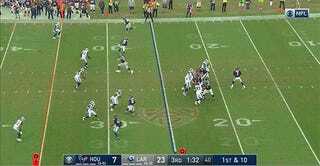 But good quarterbacking is also the ability to respond when the chaos threatens to overwhelm you, when you find yourself in Aaron Donald’s ruthless proximity with no help in sight. Some quarterbacks are only equipped to mitigate the damage in these situations—tuck the ball and take a sack, buy a second of time with a rollout and throw the ball away. Others, like Watson and Russell Wilson, can meet these moments of crisis with enough skill and improvisation to produce unexpected and implausible brilliance. 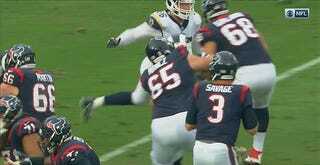 Tom Savage is neither of those types, and he can’t do either of those things. 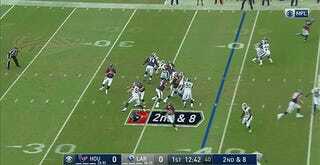 Again, there’s not much to do but take a sack when faced with an unblocked blitzer. But Savage can’t even take the sack right! 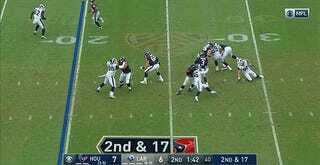 This is The Tom Savage Touch, the way he so often manages to turn what should be bad plays into a disastrous ones. There’s that brief moment of hesitation, the one that shows up in most of his drop backs, in which the ball isn’t tucked away and pinned safely to his gut, but left out there to dangle at the end of his arm, begging to be stripped away. Savage was strip-sacked twice in the first half of Week 1, once more last week against the Colts, and coughed up the ball two more times on Sunday. Watching Savage play quarterback is like watching a musician who is is a half-beat behind the rest of the band. 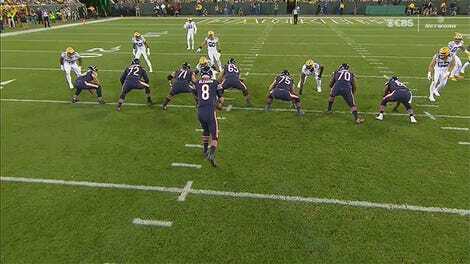 He exists to remind us of both the existence and the width of the margins that separate good quarterbacks from bad ones. Those margins look pretty huge when Savage confesses that he’d bring ruinous physical pain on himself if he tried to do the thing Watson does; they look pretty small when he trips over the fraction of a second that is the difference between a standard-issue sack and a game-changing turnover. His genius is that he never makes them invisible.